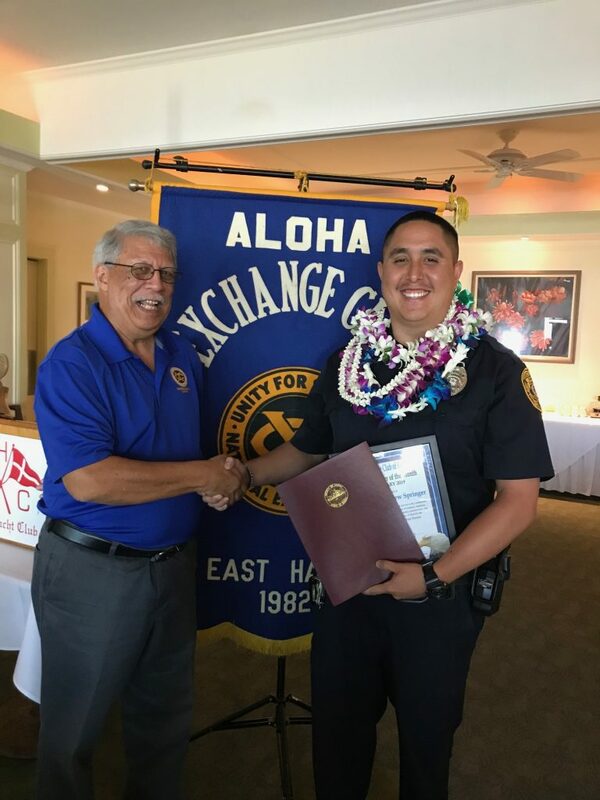 A difficult investigation that played out in the glare of a national spotlight, and saving the life of a young women, earned two Hawaii County Police officers “Officer of the Month” status. 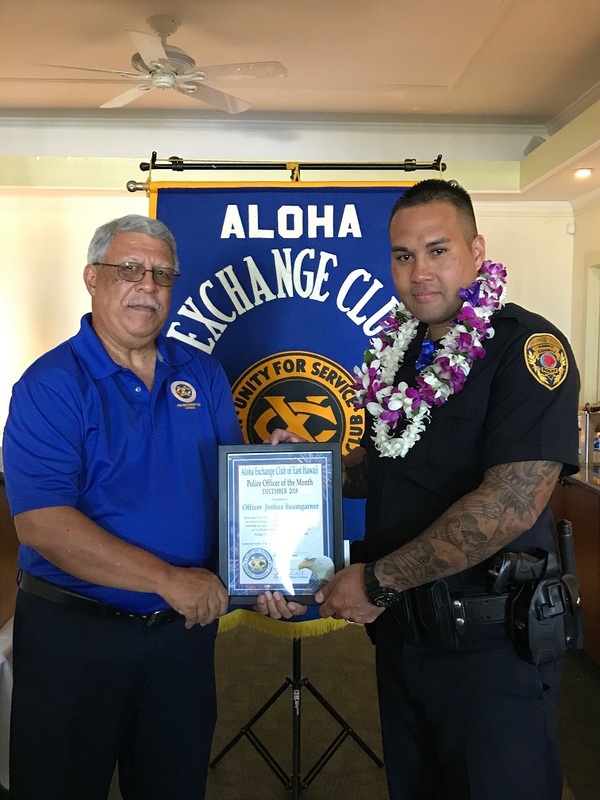 Detective Robert Almeida was named “Officer of the Month” for June for his work as lead investigator of the high-profile investigation into the strangulation death of Brittany-Jane Royal in Kalapana earlier this year, and Officer Eddie Cardines was named “Officer of the Month” for July at an Aloha Exchange Club of East Hawaiʻi luncheon last week. 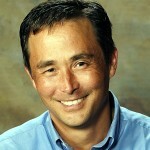 After Royal’s body was found floating in the ocean off Kalapana, Almeida was able to accurately evaluate the facts supporting his theory of the crime, despite nationwide news coverage, much of which contained misinformation and false speculation, said a Police Department Release. Ultimately, scientific and forensic analysis corroborated Almeida’s findings. Lieutenant Gregory Esteban said Almeida’s “unwavering commitment” was instrumental in resolving the case, leading to a Grand Jury indictment. 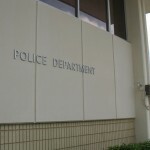 Officer Cardines immediately took steps to clear her airway and perform chest compressions, continuing for four or five minutes until Fire Department personnel arrived. “Officer Cardines’ actions and quick thinking on this call likely were key contributing factors in saving the victim’s life, assuring family members that every effort was being made to do so,” Duarte said in a statement. The victim made a full recovery. 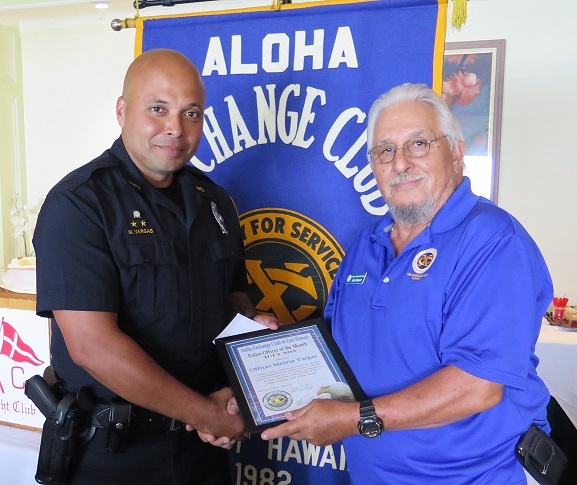 The East Hawaiʻi “Officer of the Month” award is a project of the Aloha Exchange Club.